On December 19 the Eno River Association added 22.6 acres to its 180-acre Confluence Natural Area in Orange County, and at the same time accepted the donation of a permanent Conservation Easement on an additional 19 acres from landowners Sam and Lynn Hobgood. Both acquisitions further the protection of the Eno River, and help safeguard local drinking water for over half a million residents and businesses downstream. The Eno River flows 33 miles through Orange and Durham counties into Falls Lake, the primary water supply for the City of Raleigh and other Wake County communities, along the way providing drinking water for the Town of Hillsborough and the City of Durham. 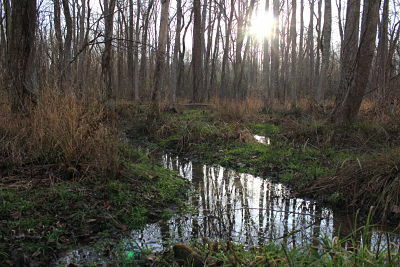 The Confluence Natural Area is located northwest of Hillsborough where the East and West Forks of the river meet to form the main stem of the Eno River. This section of the river is designated as a Nationally Significant Natural Heritage Area. With the expansion, the Confluence property will protect nearly 5 miles of stream frontage as well as outstanding habitat, including hardwood forests, fields, and wetlands. Several rare plant species have been documented on the property, including a population of yellow giant-hyssop (Agastache nepetoides) present at the edge of an old field and in the nearby woods, and three rare orchid species found in a seepage creek on the property. The orchid species have not been previously documented as occurring in Orange County, and the purple fringed orchid (Platanthera peramoena) is listed by the NC Natural Heritage Program as a Threatened species. The addition of protected land at the Confluence, along with a new pavilion and ongoing trail construction, will allow the Association to connect more people with the river and this special place. Presently the site is open on a restricted basis, but the Association has plans to open it to the public in the coming months. In addition, the Association will expand the science and nature day camp it has run for the past ten years at Eno River State Park to host a science camp for middle and high school students at the Confluence property next summer. “The Eno River Association and its members are happy to end the year with such positive news,” said Alanna Howard, President of the Association. “This land acquisition and all ongoing land protection efforts not only help with water quality but also provide special places like the Confluence for the community to get outside and connect with nature and the river. We greatly appreciate the support of our partners who helped make this project possible.” In addition to the conservation easement donation by the Hobgoods, funding support for this project came from Orange County’s Lands Legacy Program, the City of Raleigh’s Upper Neuse Clean Water Initiative, the North Carolina Clean Water Management Trust Fund, and the Triangle Community Fund. The Eno River Association is a nationally accredited land trust that has protected more than 7,170 acres for public parks and natural resources conservation on private land in Durham and Orange counties. It is known for its annual events such as Festival for the Eno, held annually over Independence Day weekend, and the New Year’s Day Hike, a tradition since 1970. The 2018 New Year’s Day Hike will be held at 2:00 pm at Eno River State Park. More information about the Eno River Association, the New Year’s Day Hike, and the Winter Hike Series can be found at www.enoriver.org.